Description: All Things in Common gets behind the "communism of the apostles" passages in Acts 2:42-47 and 4:32-37, using the anthropological categories of "social relationship" espoused by David Graeber and other anthropologists. Looking at sources ranging from the Qumran scrolls to the North African apologist Tertullian to the Roman satirist Lucian, All Things in Common reconstructs the economic practices of the early Christians and argues that what is described in Acts 2:42-47 and 4:32-37 is a long-term, widespread set of practices that were taken seriously by the early Christians, and that differentiated them significantly from the wider world. This book takes into account Judean and Hellenistic parallels to the early Christian community of goods, as well as the socioeconomic context from which it came, and traces its origins back to the very teachings of Jesus and his declaration of the Jubilee. This book will be of interest to anyone interested in Christian history, and especially the socioeconomic aspects of early Christianity, as well as anyone interested in Christian ethics and New Testament studies. It would also be of interest to anyone interested in possible alternatives to the ideology of capitalism. 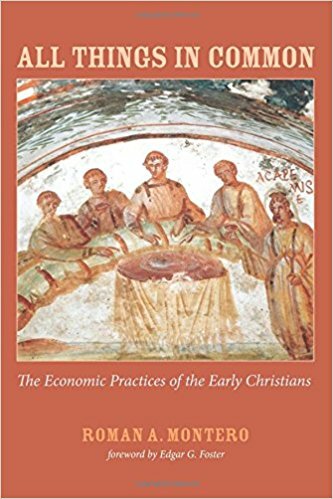 Citation: Alan C. Mitchell, review of Roman A. Montero, All Things in Common: The Economic Practices of the Early Christians, Review of Biblical Literature [http://www.bookreviews.org] (2019).